One of the great obstacles in preaching the Gospel to university students are the intellectual strongholds that have seized their minds due to the heavily atheistic and antichrist education that they are receiving in the classrooms. The plain truth of Christ is muddled and becomes a stumbling block to the enslaved mind. Paul warns in Colossians 2:8, "Beware lest any man spoil you through philosophy and vain deceit, after the tradition of men, after the rudiments of the world, and not after Christ." Where there is an increase of evil there must also be an increase of prayer; and as we read and learn of the preaching of the apostle Paul when he confronted these challenges, there must also be a reasonable presentation of Biblical truths in order to counter vain imaginations and bring restoration to the corrupted mind. Our time spent at Purdue University, Indiana, was just that. Jude called it, "Earnestly contending for the faith once delivered to the saints", and Peter said, "Be always ready to give an answer to every man that asks you for a reason of the hope that is within you." In our generation, Christianity is under incredible assault from the ruler of this world. Modern culture permeates with Satanic influences while truth lies fallen in society. I believe this is because we are drawing nearer and nearer to the end of the age when Jesus will return to the earth in great power and glory. As that day approaches, evil will come in like a flood; sorrows will grow greater in intensity, and deception with cause many to fall. We need men and women with the kind of valor that Gideon had to rise up and proclaim boldly the Gospel of salvation and everlasting truth to a dark and dying world. Jesus said, "I am the way, the truth, and the life: no man cometh unto the Father, but by me." (John 14:6) All attempts to dethrone Christ are absolutely futile; I have seen it again and again. Of all the campuses we've been on I have never heard a reasonable argument against the Lord of lords and King of kings... men seek only to serve themselves and their sin. They justify their deeds by suppressing truth... they cannot run from the inescapable knowledge of God! "Where is the wise? Where is the scribe? Where is the disputer of this world? Hath not God made foolish the wisdom of this world?" We stayed at Purdue for only one day. After the meeting was over, a Christian brother was so excited about what we were doing that he asked us to come to a gathering that evening and share about apologetics, open air preaching and Biblical evangelism. It was a wonderful time spent with them. Many of the believers had never known how to defend their faith against the waves of secular opposition. It was refreshing for them and for us to see their faith strengthened. Dear saints, we serve the Living God; we serve the risen Lord! I challenge you to be bold in your witness and stand up for Jesus within our godless societies. "Ye are the light of the world. A city that is set on a hill cannot be hid." (Matthew 5:14) Never let fear hold you back from confessing Christ before men. Never let timidity rob you of your honor to be Christ's ambassadors here on earth. God is for us, who can be against us? Stand up for Truth and watch God do mighty exploits through you unto the praise and glory of His Name. We had two wonderful days of Gospel preaching at Oklahoma University in Norman, Oklahoma and God graciously blessed our labors. Both days drew large crowds of inquisitive students who listened to the Word of God for hours and hours, and what was a great blessing was that a lot of Christians attended our meetings and were completely supportive of what we were doing. The man in the red T-shirt avidly opposed us both days, but made a spectacle of himself by his uncouth and immature behavior. The entire crowd was against him, telling him to be quiet so they could hear us. He wrote some blasphemous statements on the sidewalk but some students went and got some paper-towel and water to wipe it off; but after he left, the entire crowd was totally silent wanting to listen so I just preached an entire gospel message to them without interruption! Dear saints, please continue to hold us up in prayer as we make our way home through the mid-west, fulfilling the call to preach the Gospel to every creature. May the Name of Jesus Christ be exalted above the nations, above our cities, and in our lives! When I awoke yesterday morning, I felt the Lord pressing upon my mind with unusual keenness the word ‘deception’, to which I quickly got out of bed and turned open my Bible to 2 Thessalonians 2:3 which read, “Let no man deceive you by any means…” Those words, especially “by any means”, the Spirit seemed to enlarge. I began to jot down various means of deception as I felt compelled and very fluently penned a list down of serious warnings that had been bearing witness with my spirit for many months now, but up until then had never put them to paper. I believe these warnings of last days deceptions are of paramount importance to the Body of Christ. The prince of the power of the air is currently preparing the world for the revealing of that Wicked One, who even now is at work in the children of disobedience, but will be ruthlessly unleashed upon the earth when his time is short. It is now when the Church must take heed to the admonition of Christ, and of the apostles and prophets, “…knowing the time, that now it is high time to awake out of sleep: for now is our salvation nearer than when we believed.” (Romans 13:11) God is again calling His people out of their slumber. The major expectation of Biblical eschatology is a coming time of worldwide tribulation characterized by a great falling away, or apostasy, from the truth. This apostasy is made possible because of powerful spiritual deception, and this deception is made possible because of hazardous grounds that Satan is cultivating to prepare the heart to fall. Deception is the theme of all end time prophecy. In the Olivet Discourse, recorded three times in Scripture by Matthew, Mark and Luke, Jesus’ first statement concerning the things of the end was, “Take heed that no man deceive you.” It is because of the utmost seriousness of coming deception that Jesus said this before anything else and that the Holy Spirit confirmed this in all three gospels. Paul again reasserts this first above all in 2 Thessalonians 2:4, “Let no man deceive you by any means.” The Scriptures are giving us no excuse for being ignorant or taken by surprise. Deception is coming! I present before you now the twelve grounds for apostasy that God has laid heavy upon my spirit. It is by these preemptive means that Satan is preparing the hearts of men to fall away in the days of deception. Let us, as many as take heed, guard our hearts and our minds before it is too late. 3. No understanding – “My people are destroyed for lack of knowledge.” (Hosea 4:6) In the Parable of the Ten Virgins, Jesus tells us of ten women who were waiting for the bridegroom to appear. Five were wise, because they had oil for their lamps, and five were foolish, because they did not have oil for their lamps. The reason they had lamps is because they knew there was a time of darkness coming. However, many people miss the point of this parable by stopping right there, and saying that we must have oil, which is a symbol of the Holy Spirit. But the parable goes much deeper… for what does the oil do? The oil fuels the lamp so that it gives light, and it is the light that allows them to maneuver when the darkness falls. “The entrance of thy words giveth light; it giveth understanding unto the simple.” (Psalm 119:130) Light always represents revelation. Light is what we so desperately need when the time of darkness comes upon all the inhabitants of the earth. Paul says in 1 Thessalonians 5:5, “Ye are all the children of light, and the children of the day: we are not of the night, nor of darkness.” There are scores of people who are totally ‘in the dark’ when it comes to the prophecies concerning the end. It is this same ignorance that will cause the oblivious soul to be deceived. 4. Unwillingness to suffer – “If any man will come after me, let him deny himself, and take up his cross, and follow me.” (Matthew 16:24) The cost of discipleship is that of suffering, and yet we live in a day when even so many "Christians" are unwilling to suffer. Paul tells us plainly in the epistle to the Philippians, “For unto you it is given in the behalf of Christ, not only to believe on him, but also to suffer for his sake.” (Philippians 1:29) Tribulation is one of the promises we are granted as disciples! A person who is unwilling to suffer will cease from following and quickly depart from the faith when times of testing come upon him. He is like the seed that fell on stony ground: “Yet hath he not root in himself, but endureth for a while: for when tribulation or persecution ariseth because of the word, by and by he is offended.” (Matthew 13:21) Christianity is not for the dainty! Those who desire the comforts of this world will succumb to the pressures of adversity and will forfeit the world to come. We must be willing to suffer for the One who suffered on the cross for us! We must esteem the reproach of Christ far greater than the pleasures of Egypt. 5. Love waxed cold – “And because iniquity shall about, the love of many shall wax cold.” (Matthew 24:12) Jesus warned us of a most serious condition that would befall mankind in the last days: the love of many shall grow cold. This is both love for God and love for one another. When a person’s love grows cold they are in grave danger of being cast away, for any tree that does not bear good fruit is cut down and thrown into the fire. “If a man abide not in me, he is cast forth as a branch, and is withered; and men gather them, and cast them into the fire, and they are burned.” (John 15:6) The fruit that Jesus commands is that of love, and by our love will all men know that we are His disciples, but the fruit that this backslidden state bears is just the exact opposite: hatred, betrayal and murder. “And then shall many be offended, and shall betray one another, and shall hate one another.” (Matthew 24:10) Why does the love grow cold? Scripture tells us: because iniquity shall abound. Sin creates murderers out of us once it has dominion over us, just as it did to Cain. We are seeing in our day that Satan is executing a relentless campaign of saturating the world with immorality and iniquity. A person must be even more determined to guard his mind against temptation and passion or else he will be overcome by sin, and his godly love will be replaced by a devilish hatred that will render him a castaway. 8. Spiritual naivety – “When he speaketh a lie, he speaketh of his own: for he is a liar, and the father of it.” (John 8:44) Adolf Hitler wrote, “In the primitive simplicity of the minds of people, they more readily fall victims to the big lie than the small lie… It would never come into their heads to fabricate colossal untruths, and they would not believe that others could have the impudence to distort the truth so infamously.” (Mein Kampf, Vol. 1; Chap. 10) Is this not the conspiracy of Satan himself? I have met many naïve Christians who assert that no one would be so foolish as believe that the antichrist is the ‘this same Jesus’ of Scripture, but these do not know the supernatural nature of the power of deception. “For we wrestle not against flesh and blood, but against principalities, against powers, against the rulers of the darkness of this world, against spiritual wickedness in high places.” (Ephesians 6:12) Was not “Christian” Germany swept off their feet by Hitler who caused them to do the unthinkable? 12. Fear – “Men’s hearts failing them for fear, and for looking after those things which are coming on the earth.” (Luke 21:26) Perhaps the greatest of all obstacles people have concerning future tribulation and the affairs of the end is fearfulness, for who can deny the alarming and frightening nature of the prophecies shown forth to us in the Scriptures? The most common response to these sober matters is for people to simply ignore them altogether as a means of false security and comfort. This is why so many Christians are apathetic toward eschatology, but this is just the strategy of Satan, and this is not the disposition the Father wants His children to have! “For God hath not given us the spirit of fear; but of power, and of love, and of a sound mind.” (2 Timothy 1:7) We are not to fear the wrath of man, nor are we to fear the rage of the devil, for greater is He that is within us than he that is within the world! What if Christ was too afraid to climb the place of the Skull and shed His precious blood at Calvary for you? What if the apostles were too afraid to risk their lives and preach the Gospel to every creature as Jesus commanded? What if those heroic saints recanted their faith in Jesus for fear of the lions or of losing their heads? God forbid! The historical banner of the Church of Jesus Christ is dyed red with the blood of martyrs throughout all generations: Shall our generation fail to lift it up one last time? It is my prayer that by these examining these grounds you would see that the possibility of Biblical last days deception is a very factual reality; a reality that would rouse you to begin preparing your heart for the road of tribulation that is before us. This is not a word to instill fear in you, but a rallying cry for the Body of Christ to arm itself with the spiritual weapons that God has provided for our confrontation with the forces of evil. "Put on the whole armor of God, that ye may be able to stand against the wiles of the devil. For we wrestle not against flesh and blood, but against principalities, against powers, against the rulers of the darkness of this world, against spiritual wickedness in high places. Wherefore take unto you the whole armor of God, that ye may be able to withstand in the evil day, and having done all, to stand." (Ephesians 6:11-13) In obedience and trust, we shall find in Christ the faith and the courage to stand against the enemy and defeat him in the day of temptation. When Jesus Christ died upon the cross He made the ultimate sacrifice; He surrendered His will to the will of the Father and suffered death at the hands of wicked men. He who knew no sin became sin for us, and in laying down His life He completely destroyed the works of the devil, disarmed principalities and powers, make a public spectacle of them, won the victory over sin and overcame the world. Because Christ destroyed the works of the devil, we who believe shall destroy the works of the devil. Because Christ won the victory over sin, we who believe shall win the victory over sin. Because Christ overcame the world, we who believe shall overcome the world. "For whatsoever is born of God overcometh the world: and this is the victory that overcometh the world, even our faith." (1 John 5:4) Faith in what Jesus has already done is how we shall always triumph over every test and every trial. Let us, as many as take heed, hold fast to our profession and demonstrate that victory wherever we are: over the world, over the flesh and over the devil. Take heed, watch, pray. Are you prepared for the coming deception? The message of repentance is God's fundamental message to the world. Ever since the prophets first began to speak the oracles of God, the primal declaration has been the solemn word of repentance. Our Lord Jesus was preceded by His forerunner, John the Baptist, who cried out to Israel: "Prepare ye the way of the Lord, make His paths straight", and the Lord Himself first preached to men: "Repent, and believe the gospel." The seriousness of the issue is this: if repentance in the gospel is omitted then there is no hope for anyone to be saved. If there is not a change in a person than there is not a change in that same person's eternal destination. A sinner who fails to repent will steadfastly gaze upon the gates of hell until he has finally passed through it without a single distraction. Oh, the necessity of repentance! It is the provision of heaven for the sojourner to hell. Notice the particulars of this verse: vanity; pride; caring not... It is not so much that the sinner is unaware that Jesus indeed died on the cross... but the problem lies with his attitude toward that death, and the utter ignorance of the fact that Christ died FOR HIM on the cross, to destroy the sin which he so wickedly enjoys. He has not had a change of mind towards God and sin and Christ that would break his carnal self, causing him to tremble upon his knees. When a man repents, his mind changes toward God. No longer does he see himself as god upon the throne, but he bows the knee to the one true God and freely confesses that "Jesus Christ is Lord". A revelation of the absolute sovereignty of God causes the man to give up his futile rebellion and submit himself to the Lord's rule and authority. Then his mind is changed toward sin. No longer does he see sin as a desirable means of satisfying his carnal lusts, but sin becomes utterly repulsive and evil, for it is the transgressing of God's righteous law which deserves inexplicable punishment. How he then sees the corrupted nature of his own vile self in the light of God's unspeakable and unapproachable holiness! "Woe is me, for I am undone!" And thus, his mind changes toward Christ. At last he looks upon the cross, not as an object of scorn, but as the ultimate triumph of redeeming love where Jesus rescued his perishing soul. The repentance described in Scripture is the turning from self-saving to the saving God. "Look unto me, and be ye saved, all the ends of the earth: for I am God, and there is none else." (Isaiah 45:22) It is a humbling thing to repent. It is death to all that is self. And it is here that the righteousness of God displayed. "...repentance from dead works." Dead works are all that man tries to do to save himself; all the self-righteousness we deceive ourselves into thinking will procure our own salvation! What folly of the Pharisees! "For they being ignorant of God's righteousness, and going about to establish their own righteousness, have not submitted themselves unto the righteousness of God." (Romans 10:3) But the righteousness of God... I don't think there is a sweeter sound to the truly redeemed soul!... the righteousness of God, which is by the faith of the Son of God: "Therefore by the deeds of the law there shall no flesh be justified in his sight: for by the law is the knowledge of sin. But now the righteousness of God without the law is manifested, being witnessed by the law and the prophets; Even the righteousness of God which is by faith of Jesus Christ unto all and upon all them that believe." (Romans 3:20-22) The righteousness of Jesus Christ is worth more than a million endless lifetimes of man's attempt at Law. Glory to God! There is only one gate into heaven, let us not be confused. 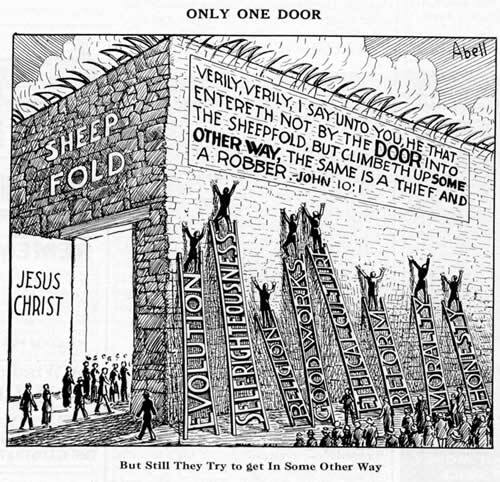 Christ is the gate, and by Him only we must be saved. If any man tries to get in any other way he is a thief and a robber. The surrender of the will is to turn aside into this living Way. Turn aside, sinner! Flee from wrath to come! Repent, or you shall perish. Repentance is not moral reform. This frame of mind has damned many souls. Repentance is a change of the mind towards God, towards sin and towards Christ. It is throwing yourself down upon the nail-pierced feet of the risen Son of God. It is the only escape from the path that leads to death. Thank you Jesus for the victory that You secured for me by Your death on the cross and Your resurrection from the dead. I repent of my dead works today and place my hope in the righteousness that is by faith in You. Help me to live everyday for the glory of Your holy Name. Well, after we left New Mexico for Oklahoma, we passed through Lubbock once again and stopped at Texas Tech to meet Jesse who was there preaching. It was great to be able to visit a campus twice, as there were many people we befriended and were able to catch up with. One of those friends was Benji, who, when we first came through, ripped up a Bible right in front of me as I was preaching, but the next day came to the meeting a totally changed person! Benji told us it was that evening when his whole life changed and Jesus claimed the throne of his heart. Glory to God! It was wonderful to see him again, and it was our privilege to make this video about his story. Just another testimony of the Lord's transforming power in this world.